Homalopsis semizonata Blyth, 1855: 187. Holotype; ZSI 8137. Type locality: Martaban (= Mattama, southern Myanmar). Homalopsis buccata: Günther, 1864: 285. Distribution. Homalopsis semizonata is known from Kawkareik, Twante near Rangoon, and Mottama, Myanmar. This species may be more widespread than known specimens suggest. Its known distribution is centered on the Gulf of Martaban, but it may extend to the north following the Ayeyarwady River and to the south following the Andaman Sea’s coastal plain in southern Myanmar and along the Andaman coast of peninsular Thailand. Frith (1977) reported on two Homalopsis from Phuket, Thailand with 40 and 42 dorsal scale rows, and 159 and 162 ventrals ― scale counts within the range of H. semizonata which is found along the same coast, about 900 km to the north. 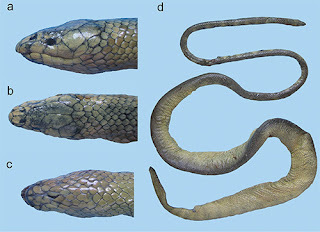 Blyth’s original description of this snake is difficult to obtain. We have included it below followed by an updated description written by us. Homalopsis semizonata, nobis. This is remarkably fine species has not of a little the aspect of Viper, from the small scales of its seize, the subdivision of its head plates, and the general colouring. Form moderately thick; the body with 39 rows of small strongly carinated scales. Vertical plate transversely divided into two; the anterior portion triangular, with apex to the front; the posterior semicircular and behind the latter is a remarkable range of five small plates, the medial being elongated backwards between the occipitals and posterior to this again is a minute inter-occipital: occipitals curiously scalloped each with three incisions; one posterior, one exterior, and one interior: two pairs of frontals; a freanal and a post-nasal. Colour pale yel-lowish-brown, marked on the upper-parts with about 36 semi annuli, which are of a blackish hue on the edges, paler within; on the hinder part of the body and tail are some black spots on the pale inter-spaces; and a medial black streak from the occiput it continued to the second transverse semi-annulus; a triangular black spot on the snout; also a blackish eye-streak; and a small spots on each occipital: lower-parts with two irregular rows of dark spots from throat to vent, bordering the scutae; and the sub-caudal scutellae are marked throughout with black. Number of scutae, 168; scutellae, 78 pairs. Length of specimen 27 in., of which tails is 6 in. It is remarkable that abdominal scute begin to divide obliquely as they approach the vent, the last two or three assuming the appreance of pairs of scutellae. Description. Note that our scale counts for this species are based mostly on neonates and late-term embryos. These snakes were collected by K. K. Gyi and are less than 300 mm SVL. Scale count data for Myanmar (Burma) Homalopsis from Gyi (1970) overlap ours, they do not mirror ours. Thus his data may be based upon specimens from a different population, or may include a second species. Rostral broader than tall; nasals in contact and semi-divided; a divided (rarely single) internasal makes narrow contact with the loreal on each side; three prefrontals, the most lateral contact the loreal; frontal is usually posteriorly fragmented; parietals about the same length as frontal; occipitals small; loreal is divided into 2–6 scales; 1/1 preocular, 1/1 supraocular, usually none or 1 subocular, 1/1 postocular; 1/1 postsubocular; 1/1 primary temporal; 12–15 upper labials, 1–4 or 1–5 contact loreal; sixth is under the orbit and occasionally in the orbit; first divided upper labial is the sixth; lower labials 15-20, with 1-3 (rarely 1–4) in contact with first chin shield; dorsal scale rows at the 10th ventral 40–44 (n = 36, x̄ = 42.08, SD = 1.21), dorsal scale rows at mid-body 39–44 (n = 36, x̄ = 41.6, SD = 1.36), dorsal scale rows at post body 30–36 (n = 36, x̄ = 32.05, SD = 1.56); ventrals in males 153–165 (n = 16, x̄ = 158.3, SD = 3.14), ventrals in females 153–164 (n = 19, x̄ = 157.5, SD = 3.21); subcaudals in males 78-90 (n = 14, x̄ = 82.2, SD = 3.02), subcaudals in females 69–77 (n = 19, x̄ = 74.45, SD = 2.37).